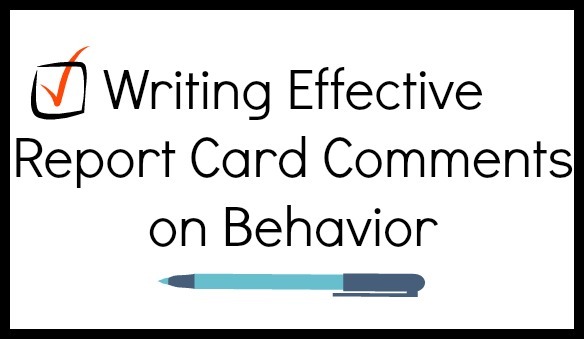 When it comes to writing report card comments and progress reports, it can be challenging to find effective words to communicate the details of each student’s progress. When writing report card comments, remember to focus on the positive first. Comments on both academic and personal behaviors should be assessed and written in a report card so that students and parents can see their strengths and areas of improvement in order to create a progressive, effective outcome. We have included some thoughtful, constructive, and easily-customizable report card comments designed to address behavior issues and strengthen parent-teacher communication and improve student behavior. ______ shares and listens. He/she works well with others. _______is a pleasant, respectful, and well-behaved student. Since our last conference, _______’s behavior has been improving. He/she is showing interest in his/her schoolwork and seems eager to learn. _______ is showing increased desire to demonstrate appropriate attitude and acceptable behavior in the classroom. _______ is learning to anticipate the consequences of his/her actions. This is improving his/her behavior because he/she is taking time to think before acting. There has been noticeable improvement in _______’s behavior. He/she has made an effort to cooperate with his/her peers and practice self-control. Thank you for your support. Lately, _______ has been working to correct his/her behavior, and I am very proud of him/her. I hope he/she continues to maintain improvement. _______ can be very aggressive towards his classmates. Perhaps we should have him/her meet with the school counselor. Please encourage _______ to use socially appropriate language at all time. Socializing seems to be more important to ­_______ than classwork. He/she has great potential, but will not realize it until he/she pays better attention in class and focuses more in his/her work. _______can be disruptive and disorderly. Please encourage him/her to be more responsible in his/her behavior, and call me to schedule a conference. The above comments open the door to communication between the teacher and parents. It demonstrates reporting behavior progress in a clear, concise, and constructive manner. A teacher’s well written report card comments will be effective and can have the power to encourage and impact students and their parents positively. For more tips on report card comments in all subjects see, Writing Effective Report Card Comments. These are awesome ideas, than you! Also, if need help with your classroom management visit Theclassroommanagementcoach.com , they have a classroom management package with tips and techniques AND classroom management consulting!